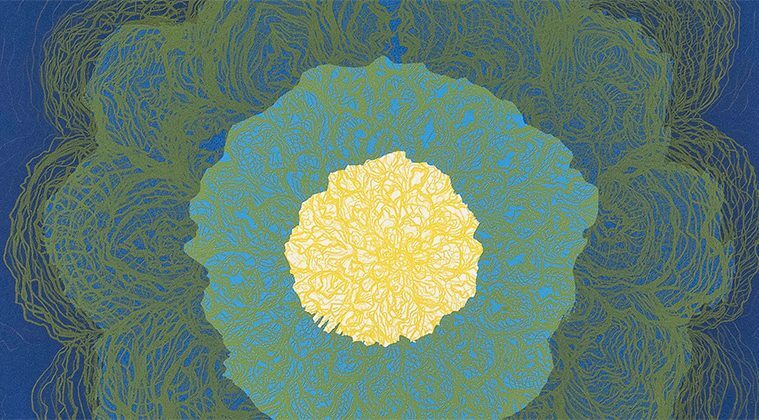 Hedda Sterne (1910–2011), Untitled (Metaphores and Metamorphoses VIII, Detail), 1967, lithograph. © 2018 The Hedda Sterne Foundation / Artists Rights Society (ARS), New York. 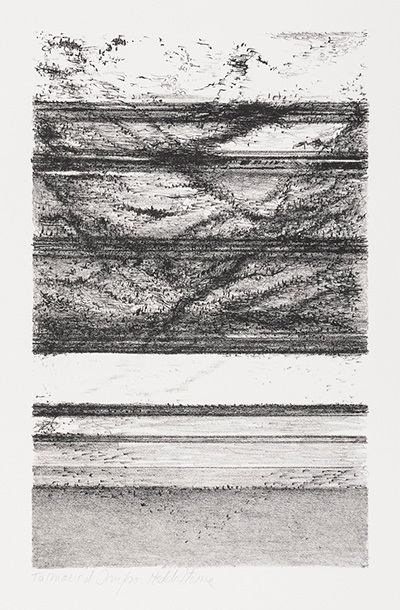 Hedda Sterne (1910–2011), Untitled (The Vertical Horizontals II), 1967, lithograph. © 2018 The Hedda Sterne Foundation / Artists Rights Society (ARS), New York. “Hedda Sterne was a prolific and wildly adventurous artist,” says Michaela Haffner, Curatorial Assistant at Amon Carter Museum of American Art and curator of Hedda Sterne: Printed Variations, on view at the Amon Carter Museum of American Art July 28, 2018 through Jan. 27, 2019. Sterne, who died in 2011 at the age of 100, defied stylistic categorization. Her art career began in the 1920s and continued over nine decades, including exhibiting with the Surrealists; she was later represented by beloved New York gallerist Betty Parsons. 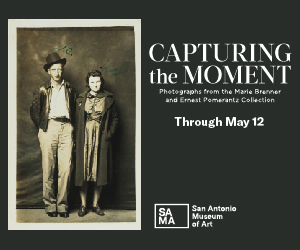 A self-described “well-working lens,” the artist’s process was one of exploration and discovery. Haffner explains that the artist’s aesthetic experiments fluctuated between organic and geometric, figural and abstract, painterly and graphic. Although Sterne’s artistic contributions were vast, she is most frequently remembered as the one and only woman included in the famous 1951 Life magazine cover photo of the Irascibles—avant-garde forerunners of Abstract Expressionism—a group known to have publicly protested the conservative bent of the Metropolitan Museum of Art’s juried exhibition American Painting Today—1950. Towering above the group in the photo, she stands in dark coat and hat, arms crossed, looking straight at the camera. I like to think Life photographer Nina Leen and Sterne collaborated on the composition. According to the Hedda Sterne Foundation, light and space were a central focus of investigation for the artist. She created her 1963 series Vertical-Horizontals while on a Fulbright Fellowship in Venice during which she experimented with mosaic and painting. The works have the effect of a wide open landscape but are restricted within the limited horizontal scope of the vertical format. Later, Sterne focused more on drawing and created an organic abstraction series called Lettuces and Baldanders. Printed Variations, culled from the Amon Carter’s collection, features two thematic series, which Sterne made at the Tamarind Lithography Workshop in 1967, related to the Venice works and 1960s drawings: Metamorphoses and Vertical-Horizontals. Both series show the artist’s tendency to explore and experiment with a single theme. Hedda Sterne (1910–2011), Untitled (Metaphores and Metamorphoses VII), 1967, lithograph. 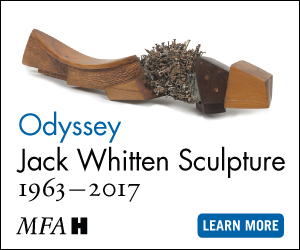 © 2018 The Hedda Sterne Foundation / Artists Rights Society (ARS), New York. To create Metaphores and Metamorphoses, Sterne studied the intricacies of vegetal folds in a head of lettuce. True to her penchant for exploration, she reworked the subject in numerous styles, colors, and papers. Some renderings have a delicate, layered, almost three-dimensional effect while others look ghostly in pale ink against dark or saturated backgrounds, and still others take shape through the use of bold, solid color. Lettuce becomes flower, becomes sea creature, becomes pinwheel. The equally delicate black and white series Vertical-Horizontals depicts a study of atmosphere, horizon, landscape and perspective through a range of values. Sharp, dark pinpoints of ink sweep across the surface, and bands of black imply strata and the passage of time. “The Amon Carter has a robust collection of works on paper, with the Tamarind lithographs serving as the foundation of this collection with more than 2,000 prints. 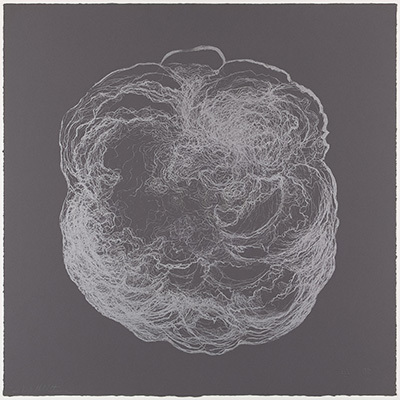 Sterne’s prints complement a stellar survey of works on paper by women modernists in our collection, including Louise Nevelson, Ruth Asawa, Gego, Helen Frankenthaler, and June Wayne,” says Haffner. The artist’s lithographs have never been exhibited at the Amon Carter, and Haffner says she “relished the opportunity to dive into their history and give them their due time and attention.” A standout move, indeed.